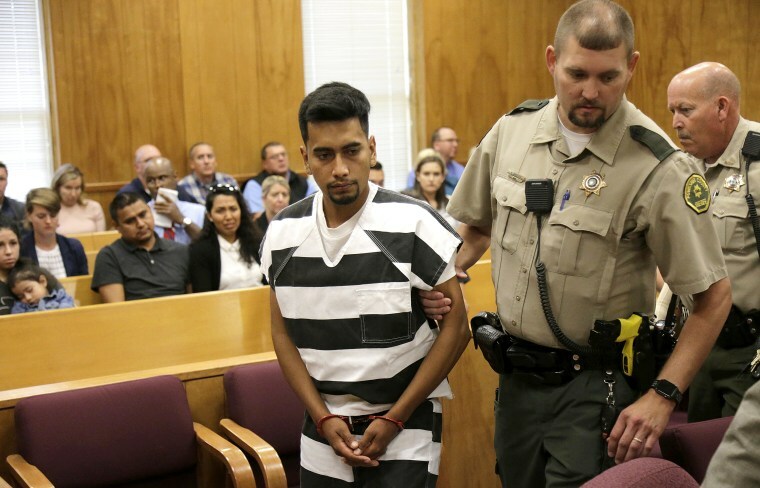 Cristhian Bahena Rivera was charged after they found Tibbetts' body in a field near Brooklyn, Iowa, where she was jogging when she vanished about a month earlier. A farm worker accused of stabbing University of Iowa student Mollie Tibbetts to death pleaded not guilty to first-degree murder Wednesday. Cristhian Bahena Rivera, 24, entered the plea in a nine-minute appearance at the Poweshiek County Courthouse in Montezuma, Iowa. Rivera was charged last month with stabbing Tibbetts, 20, to death. Officials announced the charge hours after they found what they believed to be Tibbetts' body in a farm field east of her hometown of Brooklyn, Iowa. Tibbetts was jogging in Brooklyn when she vanished more than a month earlier, sparking an exhaustive search for the student. Dozens of volunteers in the small town had scoured the fields around her house, while authorities searched by air and on the ground. And Crime Stoppers of Central Iowa had offered a reward of nearly $400,000 for any tip that led to her safe return. Officials said they used surveillance video to track down Rivera, who ultimately led them to Tibbetts' body. The video showed Tibbetts jogging in a rural area near her hometown as well as Rivera's car. “I can’t speak about the motive. I can just tell you that it seemed that he followed her, seemed to be drawn to her on that particular day, for whatever reason he chose to abduct her,” DCI Special Agent Rick Rahn told reporters at the time. "He told us he had seen Mollie in the past and on that particular day, July 18, 2018, he happened to see her, he was drawn to her, and as a result, kind of followed her around a little bit and ultimately confronted her and ended up tackling her and ultimately abducting her," Rahn said. He added Rivera showed little emotion during the interview, or later when he led them to the body. Rivera was an employee of Yarrabee Farms, a "small family farm" owned by Dane Lang and Craig Lang, a prominent Iowa farmer and former GOP candidate for the state's agriculture secretary, according to the Associated Press. Rivera, a Mexican national who is allegedly undocumented, waived his right to be tried within 90 days. His trial is set for April 16.